That's something that Carrie Adams has come to understand quite well. For her, that has meant making significant changes in her life every five years or so. Although she had just finished her first year teaching at Westside Christian High School in Tigard, Adams felt a transition was in store this past summer, so she opened herself to new opportunities and possibilities. 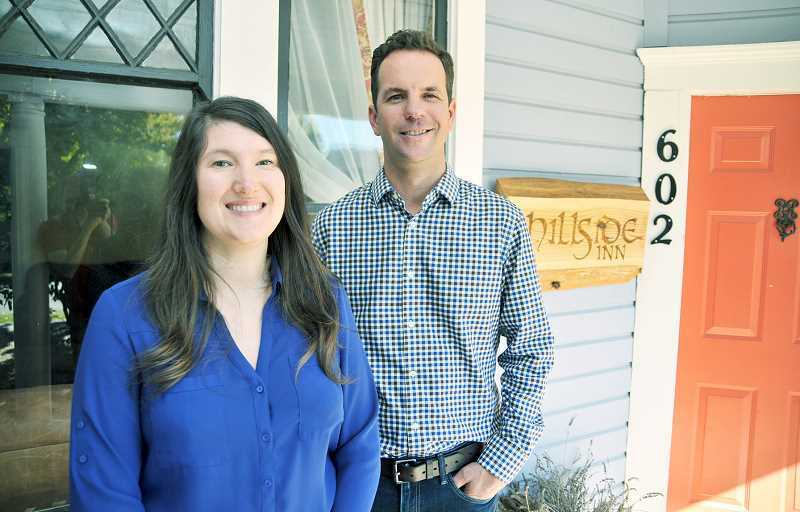 The timing couldn't have been better for Hillside Inn director Sean Flannery, who was in his own season of discernment in regard to the organizational development of Church of the Vine's refuge and transitional-living ministry for young adults. The inn was in large part inspired by L'Abri, the international community of study centers that offer respite and the chance to seek answers to deep questions about God. Adams and her husband, Jeff, had not only spent six months in residence at L'Abri in London, but also worked at the L'Abri center in Vancouver, British Columbia, Canada, prior to moving to Newberg five years ago. The couple eventually determined they were ready for a return to hospitality ministry and after moving to a larger house in the country in 2017, also had a large, finished basement they felt could be put to good use. They reached out to Flannery to see if it might be of use to the inn, but what he really needed was someone to replace him as director. "It looks like L'Abri," Adams said of the inn. "It's old and dusty and just feels like home to me. Through a time of prayer and sharing my heart and my visions, we felt as if this would be a good partnership." Adams stepped down from her teaching job, assumed director duties in August and most of the other necessary pieces have correspondingly fallen into place around that decision. That includes renting their basement to a Veritas teacher and her family as well as a $1,000 monthly stipend from Chehalem Valley Presbyterian Church, where Adams attends, to support her work at the inn for the remainder of 2018. Bringing Adams on also set off a chain of dominoes for Flannery and Church of the Vine. When he was first approached by Carrie and Jeff, Flannery had just gained some clarity about his need to step back from the day-to-day duties of director so that he could transition to an executive director role and recruit community partners to help establish Hillside Inn as an independent nonprofit ministry. Eventually, that will allow him to focus his efforts on Church of the Vine. "I had to make peace with taking this thing I love and have ownership of and saying this is a gift for me to be a new role and I'm ready for whatever that is," Flannery said. "To then have Jeff and Carrie come and name what they named, that's when it became clear what it means. That was so freeing." Hillside Inn has branded itself as "A Place for Prodigals," which is how Adams felt about herself when she first studied at L'Abri. "My wanderings didn't actually begin until my 20s, but they were profound," Adams said. "Some prodigals take a physical journey away from home, some take a spiritual journey away from home. My wanderings weren't mitigated until I went to L'Abri. And while serving as director at the inn feels like a homecoming for her in terms of returning to hospitality, it's also been a transition to learn its peculiarities. "This is a strange thing that looks like L'Abri, but is not L'Abri, so it's been two months of figuring out, seeing who's here and what they need," Adams said. "The hard work that has gone into building the framework is good. There is a good framework here, good bones, and it's exciting to be creating space for people." What has been familiar and will continue to be a hallmark of the inn is how it provides layers of community to support its residents. Adams likes to jokingly compare the dynamic to that of the upstairs-downstairs dichotomy popularized on British television, except without the accents and uniforms. "The work downstairs is making breakfast conversation and inviting people into that space early in the morning," Adams said. "Upstairs it's learning how to lead and guide a community, confront conflict and negotiate things in people's lives that are really difficult. Upstairs we use words and downstairs we use deeds: I will converse, I will be with you, I will read a book with you, play a game, eat." Adams said she is not the kind of leader to come in and make quick changes anyway, but feels that would be especially unwise considering the inn is just beginning to explore how it will evolve organizationally. "My order of proceeding has been to create community with the staff that we can then create and invite the residents into," Adams said. "There is community here as we ask them to participate in structures and rhythms and rest and, hopefully, human flourishing through relationships and community." Northside Community Church will host the AND Women's Conference at 7 p.m. Nov. 2 and at 9 a.m. Nov. 3. Cost is $10 and lunch is included. For more information, or to register, visit www.northsidenewberg.org or call 503-538-0440. Joyful Servant Lutheran will host its Trunk R Treat event for families at 6 p.m. Oct. 27. All are welcome to partake in the activities, including hot dogs, games and face painting. For more information, call 503-538-0475. Northside Community Church will host its annual Trunk or Treat Halloween event from 6 to 8 p.m. Oct. 27. Dress up, decorate a trunk and have some fun at a family night of goodness and goodies. Candy donations are welcome. There is no need to sign up or register. For more information, call 503-538-0440.